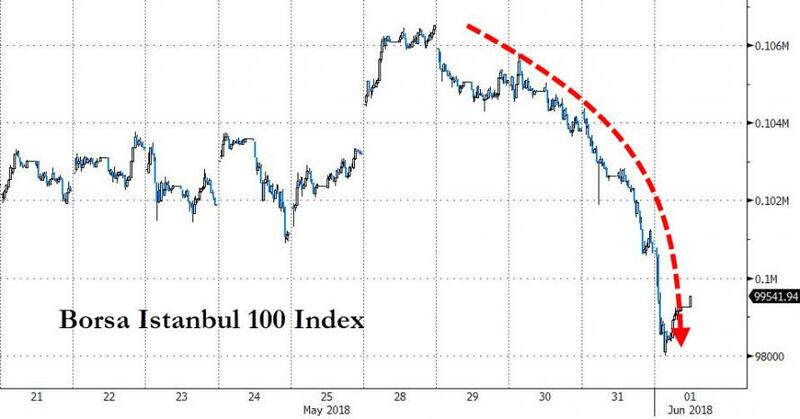 Turkish stocks are down most in a month and the Lira is tumbling from its dead cat bounce after Turkey’s President Recep Tayyip Erdogan last night called on Turkish citizens to repatriate assets from abroad... prompting fears that this is pre-empting capital controls that he has previously promised would not occur. “The market is coming to realize that the problems are structural and thus interest rate increases aren’t enough to stem the lira decline,” Burak Cetinceker, a fund manager at Strateji Portfoy in Istanbul, said by email. 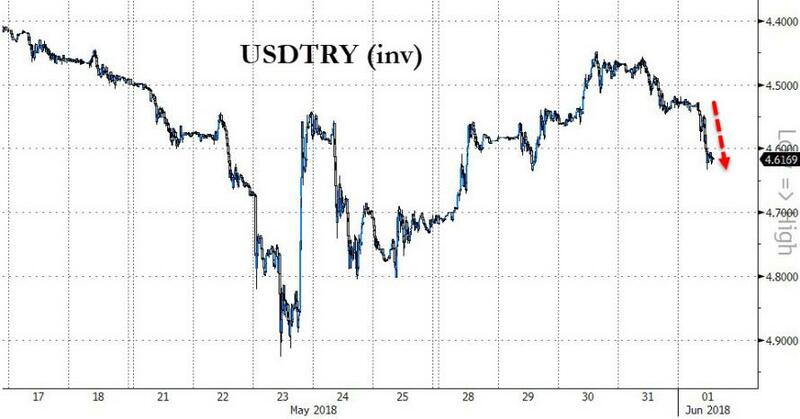 The lira’s slide on Thursday was due to “various speculations,” including one about a possible rating downgrade, but those losses are extending today following Erdogan's demands that Turks "teach a lesson" to foreigners trying to shake the Turkish economy. “Let’s teach a lesson to those who are trying to shake the economy and stability through foreign currency,” Turkey’s President Recep Tayyip Erdogan says late Thursday as he calls on all Turkish citizens to bring assets from abroad and convert their FX deposits to lira, according to state-run Anadolu Agency. Erdogan, speaking during a rally in southeastern Malatya ahead of parliamentary and presidential elections on June 24, calls on Turks to benefit from regulations easing tax on assets brought from abroad. However, his comments have been construed as potentially signaling pre-emptive repatriation ahead of capital controls. As Bloomberg reports, data due Monday will show consumer-price increases quickened to 12.15 percent in May, according to the median estimate in a Bloomberg survey, approaching a 14-year high of 13 percent reached last year. While the central bank is said to be prepared to raise interest rates again if inflation picks up pace, analysts at Capital Economics in London say it will likely to stay on hold at the next meeting on June 7.